Graham Miller Here it comes. The one we all dread – but also, the one with some real reward. Find a grotty toilet, take a bag of cleaning equipment, and make that thing shine. Walk straight into the inconvenient, the uncomfortable, and the grimy. Serve low today. Green: Don’t avoid the blocked up public toilet; give it a flush and a brush! Amber: Get in touch with a friend you know has a busy schedule. Offer to go over and do their washing up. Red: If there’s a student village or area near you, find a street and go door-to-door offering to clean kitchens. If not, ask a local family. Here I am, knocking on doors on a wet Saturday in South London… Surely there must be some more strategic way to serve the Lord, some better use of my talents? I hope that this next place doesn’t have a dog. I hope they don’t start swearing at me again. I could really use a cup of tea. Maybe Olga at number 43 will be in. She always offers me a cup of tea, with lipstick marks on the brim. Then there are the dog hairs all over her old sofa; I hate dogs. I’ll keep knocking. Oh good, Stefano is in. I did some shopping for him last week because he can’t get out anymore. Great, he’s inviting me in out of the rain, and he’s made me a cup of tea. He asks me to help unblock his sink and whilst I set about unblocking we get to talking about the faith he left behind as a kid, and why I still believe in Jesus. We open up the Bible and I show him how it is reliable, how lots of the prophecies about Jesus really came true. I talk about God’s personal love and suddenly he is crying and asking me to pray for him. Before he died Stefano invited all of his friends from the estate to our local church and he told them his testimony. At his funeral there were enormous numbers of well-wishers who were deeply impacted by the faith Stefano had found in the months before his death. My idea of what is strategic and what isn’t strategic is different to God’s. We trust in a saviour who left heaven to be a carpenter in Nazareth to save us. Sometimes, knocking on an elderly neighbour’s door in the pouring rain is the most significant action we will take this year. 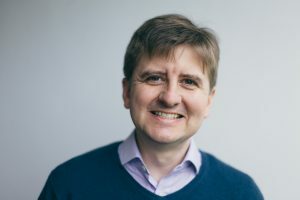 Graham Miller is Chief Servant at London City Mission. He lives in Wandsworth with his wife and two children, whom he tries to persuade to follow Liverpool Football Club.